spring is finally here, and i really couldn’t be more thrilled! i love the spring season, with everything growing new and fresh! easter has snuck up on me this year, can you believe it’s this sunday? 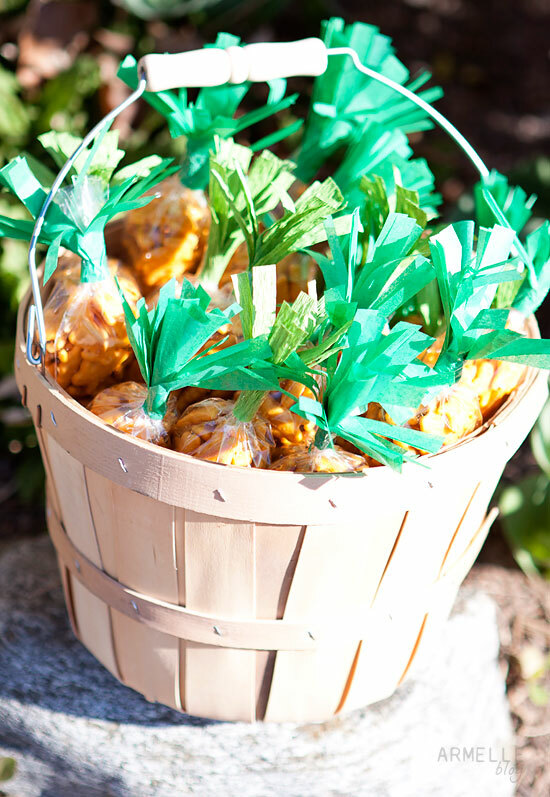 if you are scrambling for some fun easter treats, then this non-candy easter “carrot” snack would be a great addition to your kids easter basket, or a great treat to pass out at your easter egg hunt! i’ve seen fun “carrots” at the store filled with orange easter candies, but i thought it would be super fun to use annie’s cheddar bunnies cheese crackers. the bunnies are a perfect detail for an easter snack! 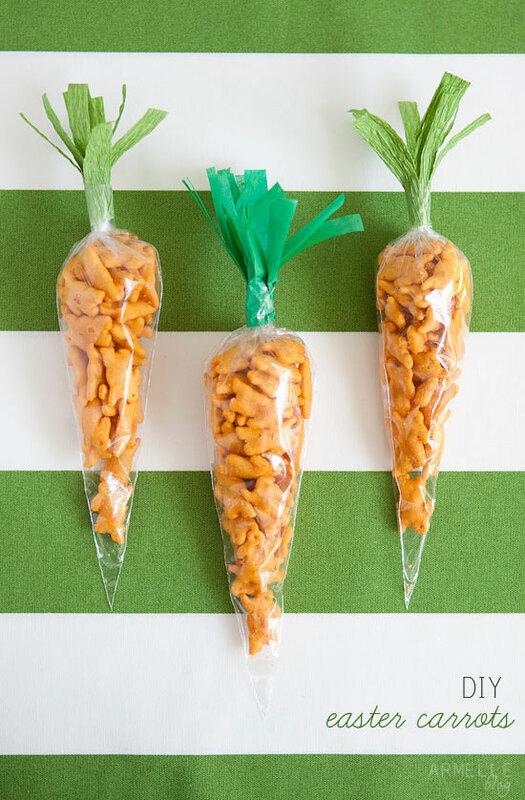 1) fill the cone-shaped bag with the desired amount of cheddar bunny crackers and twist the top of the bag closed. 2) seal the top of the bag closed with a small piece of tape around the twisted area. 3) cut off any excess plastic bag just above where you taped. 4) cut 2 to 2 1/2 in strips of tissue/crepe paper and then cut fringe into the paper on one side stopping about 1/4 to 1/2 inch before you cut through to the other side. 5) take the tissue/crepe paper and wrap it around the tip of the plastic cone bag a few times with the fringy part facing the top. 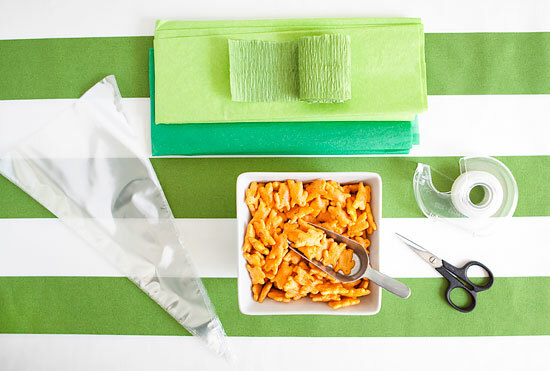 6) take a small piece of tape, and tape the crepe/tissue paper into place. arrange the fringe, and viola! 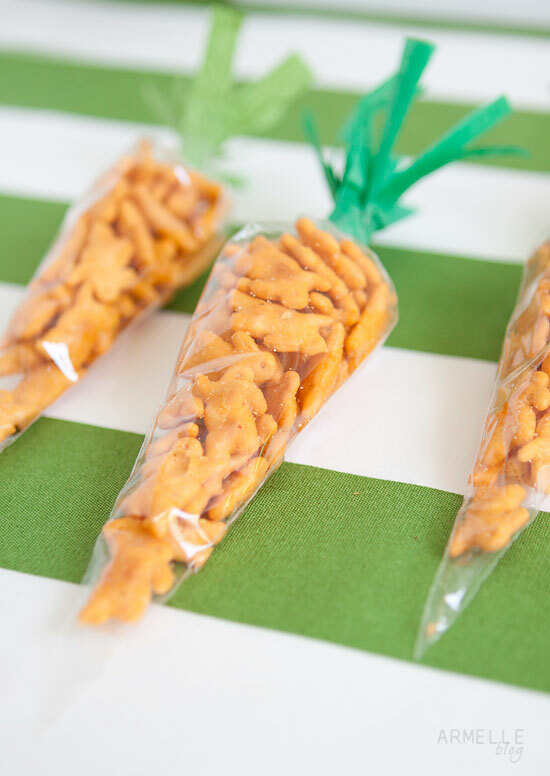 fun “easter” carrots that your children will love! my kids helped me make some for an easter party we attended this week! they had so much fun putting them together, and they just loved giving them to their little friends! Wow this is SO AWESOME. Especially since it would look good in an Easter basket without adding to the sweets. SO cute. I love your tie-dyed eggs too! I’m doing an Easter link up today over on my blog…http://rustsunshine.blogspot.com. Would love it if you joined us!